Does your husband have any ties that he doesn’t wear, that are ruined in the front or just not his style. 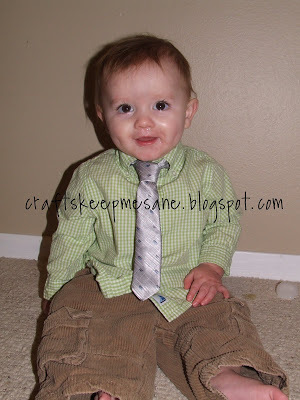 Then reuse them and make a little baby tie! These are so cute and super easy to make. 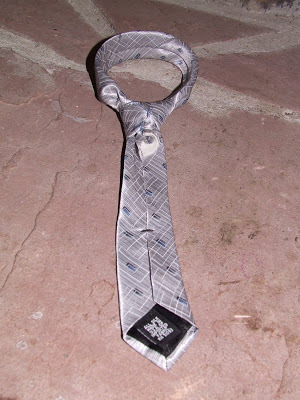 If you can tie a tie, then you can make this. I love all of boy stuff to make, plus my boys love it when I make them things to wear. 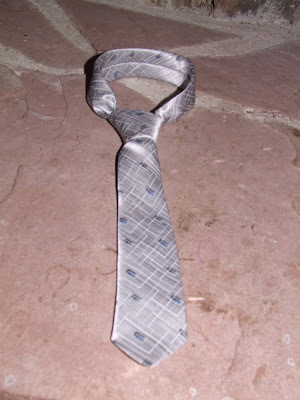 1) Take a regular tie and tie the back side to the desired length. Once you have the desired length of the tie, measure the size of the child’s neck (with a shirt on) and make the loop that length. I always like to go an inch bigger, just in case. 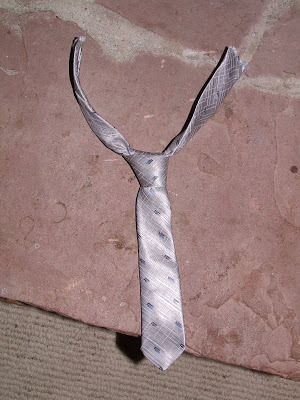 2) Next cut off the long end of the tie right at the knot. Also, put a couple of stitches in the knot so that it will not fall apart, I always do more than necessary just in case. 4) Attach velcro to the ends of the loop. I stitched the ends of the tie so they wouldn’t far apart and then added the velcro. These work great for babies and toddlers, but I even made on for my 4 year old. I just made it longer. It just looks like a nice skinny tie. My boys are always excited for something new! Awesome! My husband doesn't wear a lot of his ties; he likes to wear the same one every Sunday. So I can make a bunch. Thanks for sharing! 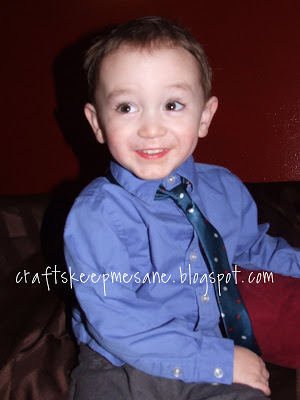 thank you so much for posting this…my 5 year old wants a tie so bad!!! genius! thank you thank you! Wow, what a fantastic idea! You can't ever find exactly what you are looking for with boy's ties, the choices are so limited. Great post! Please feel free to link up to Talented Tuesdays over at My Frugal Family! oh my sweetness! The tie is pretty cute too. I forgot about this idea! Thanks for reminding me. I featured it on the tie post! Very creative! My husband asked what I was looking at and said, "Oh, that's a cute idea! Maybe do that for our Christmas pictures so we match." Ha! This is so darling! Cute model too! Thanks for sharing – I definitly have to keep this in mind! What a sweet little model you have, watch out GQ, you've got competiton. Very cute and thrifty idea. Very cute! My husband has a whole closet full of ties and I think he rotates maybe 4! I now know what I am going to do with the others! Thanks! 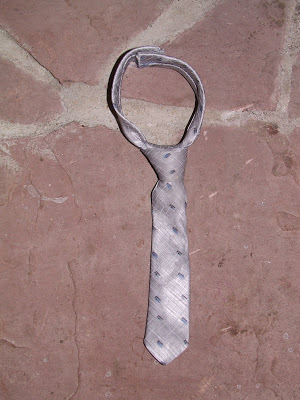 What a good idea for re-using an old tie– and any little boy would love to have something just like Daddy's! 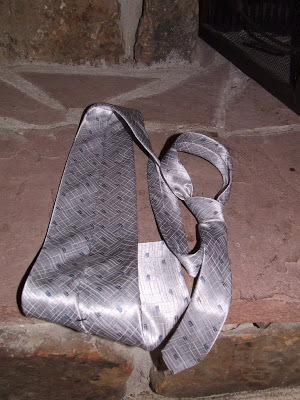 This is so adorable..my husband has so many ties that he doesnt want anymore…now i will make some for the little guy….Thanks for sharing..
That is just genius! Now if only my little guy would wear one. What a great idea! Very cute. So cute! My son wants a tie to wear on Christmas and I love using what's around the house. This is genius! Thanks!